Crude oil production in 2014-15 upto December 2014 is about 28.171 Million Metric Tonne (MMT) by ONGC, OIL and Private/ JV Companies. About 68.5% of crude oil is by ONGC and OIL from nomination regime and remaining 31.5% of crude oil production is by Private/JV companies from PSC regime. Natural gas production in 2014-15 upto December 2014 is about 25.319 Billion Cubic Metre (BCM) or 92.1 MMSCMD by ONGC, OIL and Private/ JV Companies. About 73.7% of natural gas production was by ONGC and OIL from nomination regime and remaining 26.3% of natural gas production was by Private/JV companies from PSC regime. 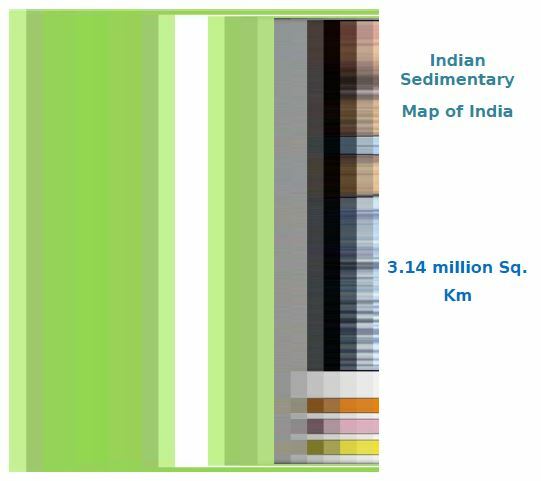 India has 26 sedimentary basins covering an area of 3.14 million square kilometres. The sedimentary basins of India, on land and offshore up to the 400m isobath, have an aerial extent of about 1.84 million sq. km. In the deep water beyond the 400m isobath, the sedimentary area has been estimated to be about 1.30 million sq. km. M/s Schlumberger : 300 to 2100 TCF of shale gas resource for the country. United States Geological Survey (USGS) has also estimated technically recoverable shale gas resources of 6.1 TCF in 3 basins (Cambay Onland, , Krishna Godavari Onland & Cauvery Onland) Further, USGS has indicated that these basins have also potential for shale oil. The last Hydrocarbon resources assessment exercise was carried out approximately two decades ago. During the course of implementation of pre-NELP (New Exploration Licensing Policy) and NELP rounds and other exploration and production activities, substantial geo scientific data have been generated. New oil and gas fields have also been discovered by utilizing improved geological understanding and new technology. With the increase in exploration spread and quantum jump in availability of geo-scientific data generated under NELP, there is a need to revisit the hydrocarbon resource assessment of all sedimentary basins of India. A Multi Organization Team (MOT) comprising of representatives of ONGC, OIL and DGH is carrying out estimation of hydrocarbon resource potential in the country. The exercise of re-assessment of hydrocarbon resources for all the sedimentary basins in the country is in progress. This project is likely to be completed in 2016-17. In order to harness CBM ( Coal Bed Methane) potential in the country, CBM blocks were offered through international competitive bidding for exploration and production of CBM in the country for the first time in May 2001. So far, Government has awarded 30 CBM blocks under four rounds of bidding to National, Private & Joint Venture Companies. In addition, 2 CBM blocks were awarded on nomination basis and one block through Foreign Investment Promotion Board (FIPB) route. These CBM blocks are in the states of Andhra Pradesh, Assam, Chhattisgarh, Gujarat, Jharkhand, Madhya Pradesh Maharashtra, Odisha Rajasthan, Tamil Nadu and West Bengal. Commercial production of CBM in India has already commenced w.e.f. July 2007 in Raniganj (South) block in West Bengal operated by Great Eastern Energy Corporation Limited (GEECL). Current CBM production in the Raniganj (South) block is about 0.35 MMSCMD. Additionally, two blocks, Raniganj (East) block operated by Essar Oil Limited is producing at the rate of 0.22 MMSCMD and Jharia operated by ONGC is producing at the rate of 6200 SCMD. Shale Gas can emerge as an important new source of energy in the country. India has several Shale formations which seem to hold Shale Gas and oil. The Shale Gas formations are spread over several sedimentary basins such as Cambay, Gondwana, Krishna-Godavari and Cauvery onland. The Government has issued “Policy Guidelines for Exploration and Exploitation of Shale Gas and Oil by National Oil Companies under Nomination regime” on 14th October, 2013. Under this Policy, the right to exploration and exploitation of Shale Gas & Oil will lie with the NOCs holding Petroleum Exploration License (PEL)/Petroleum Mining Lease (PML) granted under the nomination regime. ONGC has commenced drilling of one well in Cambay basin in Gujarat for shale gas/Shale Oil exploration. Currently, there is no commercial production of shale gas in the country. It is estimated that a number of sedimentary basins (Gangetic plain, Gujarat, Rajasthan, Andhra Pradesh & other coastal areas) in India, including the hydrocarbon bearing ones – Cambay, Assam-Arakan, & Damodar – have large shale deposits. 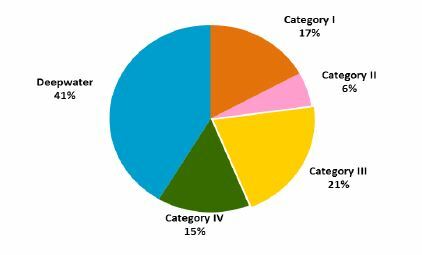 Various agencies have made different estimates of shale gas and oil in the Indian sedimentary basins. M/s Schlumberger: 300 to 2100 TCF of shale gas resource for the country. Energy Information Administration (EIA), USA in 2011: 290 TCF of shale gas in 4 basins (Cambay Onland, Damodar, Krishna Godavari Onland & Cauvery Onland). Energy Information Administration (EIA), USA in 2013: 584 TCF of shale gas and 87 billion Barrels of shale oil in 4 basins (Cambay Onland, Damodar, Krishna Godavari Onland& Cauvery Onland). ONGC: 187.5 TCF of shale gas in 5 basins (Cambay Onland, Ganga Valley, Assam & Assam Arakan, Krishna Godavari Onland & Cauvery Onland. Central Mine Planning and Design Institute (CMPDI): 45 TCF of shale gas in 6 sub basins (Jharia, Bokaro, North Karanpura, South Karanpura, Raniganj & Sohagpur). United States Geological Survey (USGS) has also estimated technically recoverable shale gas resources of 6.1 TCF in 3 basins (Cambay Onland, Krishna Godavari Onland & Cauvery Onland). Further, USGS has indicated that these basins have also potential for shale oil. NGHP Expedition 02 aims at identifying sites. NGHP Expedition 02 will consist of LWD (Logging while drilling), Coring and wire line logging programme at 20 sites in the deep water KG & Mahanadi basins. The task of identifying locations has been completed. The task of carrying out the drilling and coring programme under the NGHP Expedition-02 has been assigned to ONGC. Expenditure of NGHP Expedition-02 will be shared by 50% funds from OIDB, 20% from ONGC and 10% each from OIL, GAIL and IOCL. ONGC will be executing the NGHP Expedition-02. Expedition 03 aims at carrying out pilot production testing of at least one site in the Indian deep-water environment. However, the success of Expedition-03 depends on the success of NGHP Expedition-02.